Toilet bowl cleaners like any cleaners you can buy to use in your home, tend to have a ton of harsh chemicals. Definitely nothing I like to have out around the kids. However there is a very simple way to make Homemade Toilet Bowl Cleaner using natural ingredients and it will cost you so much less than what you can buy in stores. 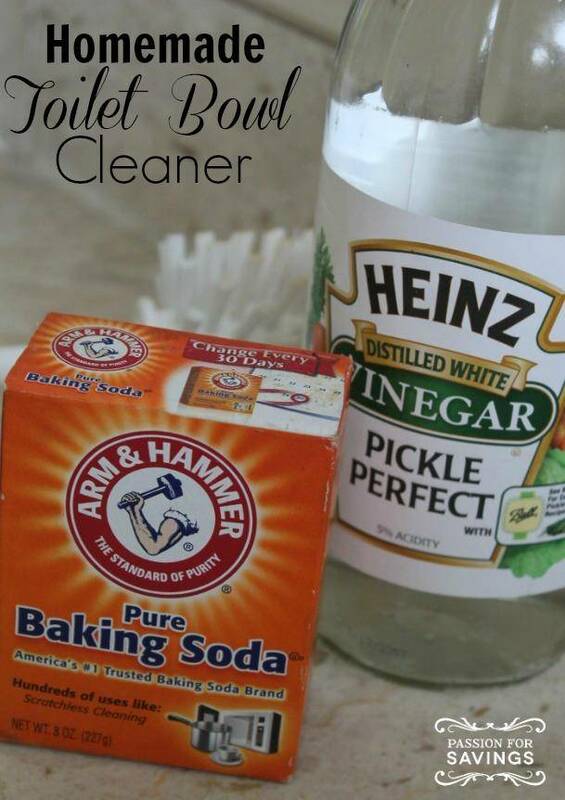 A simple homemade toilet bowl cleaner can be made with two ingredients you likely already have in your kitchen cupboard – Vinegar and Baking Soda. A great way to really get your toilet bowl clean is to actually remove all of the water while you are cleaning it. This is a great way to give it a good cleaning without using the water that is in the bowl. 1) Turn off the toilet’s water shutoff value so water will no longer fill the toilet when you flush. You can do this by finding the value under the toilet and turning it clockwise as far as it will go. 2) Flush the toilet, and keep flushing it until there is no longer water inside the toilet bowl. 3) Take about a cup of baking soda and sprinkle it around the inside of the toilet bowl. With a spray bottle, spray vinegar all over the bowl of the toilet, including underneath the rim. 4) Let the mixture sit for a few minutes (up to 15) and then scrub the entire bowl with a toilet brush. 5) If possible, to give it a good cleaning, leave the mixture in the bowl overnight or at least for a few hours. Then give it another good scrubbing. 6) Turn the value back on and flush to fill the bowl back up with water. Not only does this process get your toilet bowl sparkling clean, it is very inexpensive to do. Not to mention you are using all natural ingredients that are much safer to have in your home. Have you ever used anything other than store bought cleaner to clean your toilet? I think that it is very interesting that you could just use vinegar and baking soda to make a cleaning solution for your toilet. I really like how simple the ingredients are, but I’m a bit concerned about how well it would disinfect the toilet. Do you think that it would be okay in that regard without any rubbing alcohol? Other than that, I’d probably want to add some essential oils to the mix too. Well this looked promising, but there must be something different about my toilet, as I couldn’t get all the water in the bowl to leave. Once the water valve was turned off no more water went in, but the water that was in didn’t go out either! It did a decent job on the area above the water. Good one… Will try this tonight. I guess the correct word is water ‘valve’ not ‘value’… It confused me a bit.